Laurie was up past 10pm fiddeling with the star mode on her camera. With a clear sky and no moon, it was the perfect time to play. Unfortunately she was too stubborn to watch a video we had downloaded on how to use the star features on the camera; she preferred trial and error. Tonight, error was victorious. At least initially. Laurie went to bed discouraged. We were both tossing and turning and Andy suggested Laurie try again. It was 3:30am but the stars were bright and Laurie was wide awake. She put on all of her layers and ventured out into the windy, stary night. Learning from her mistakes earlier in the night, she played around and got some fun shots. 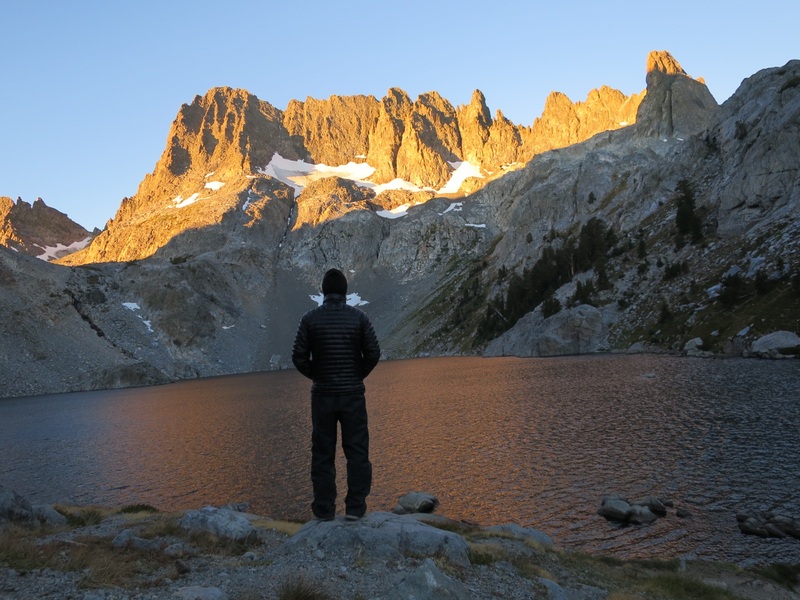 Laurie napped for an hour between 5 and 6 but once the morning light hit the Minarets she was wide awake again with camera in hand. We drank hot water and ate breakfast staring at the Minarets. We watched as orange light washed over the top of the peaks and then faded. We packed up our belongings and were walking by 8 am. 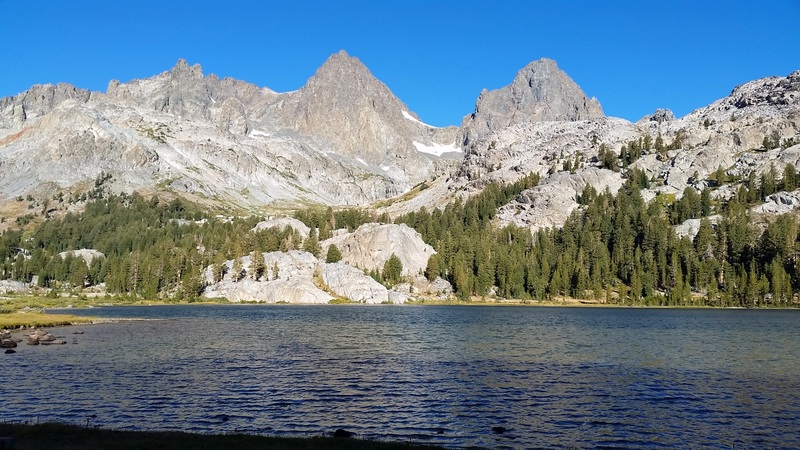 We hiked down through an alpine meadow and dropped into the southern side of Lake Ediza. 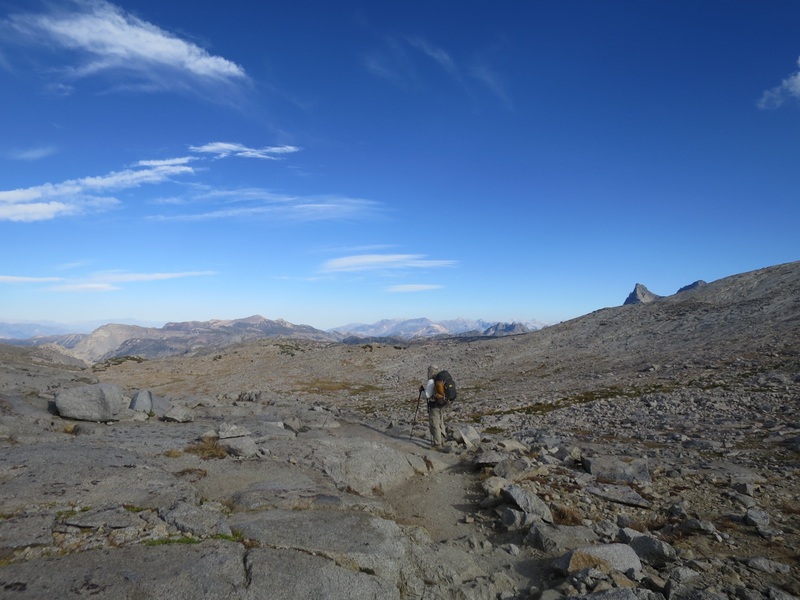 We continued to descend, past the Lake Ediza outlet and followed the Shadow Creek trail back to the JMT. 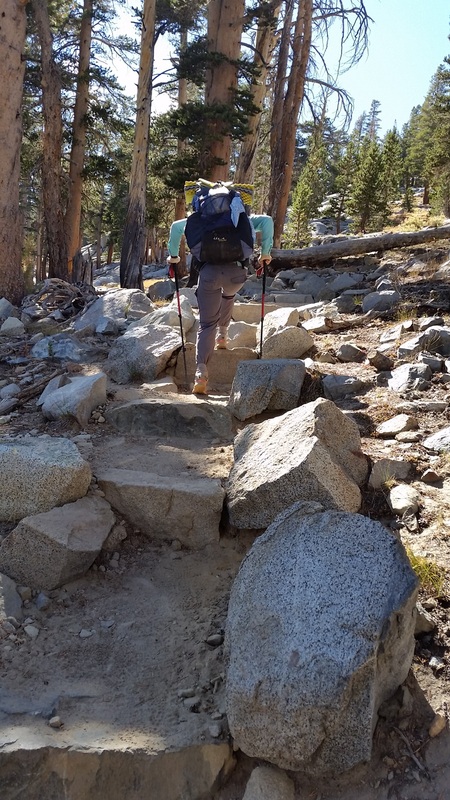 This is one of the few places where the JMT and PCT are not the same trail (Mt Whitney and Yosemite Valley are the others). Once back on the JMT we climbed up toward Garnet Lake. The sun was warm and the trail quite dusty. Garnet Lake is exceptionally beautiful. 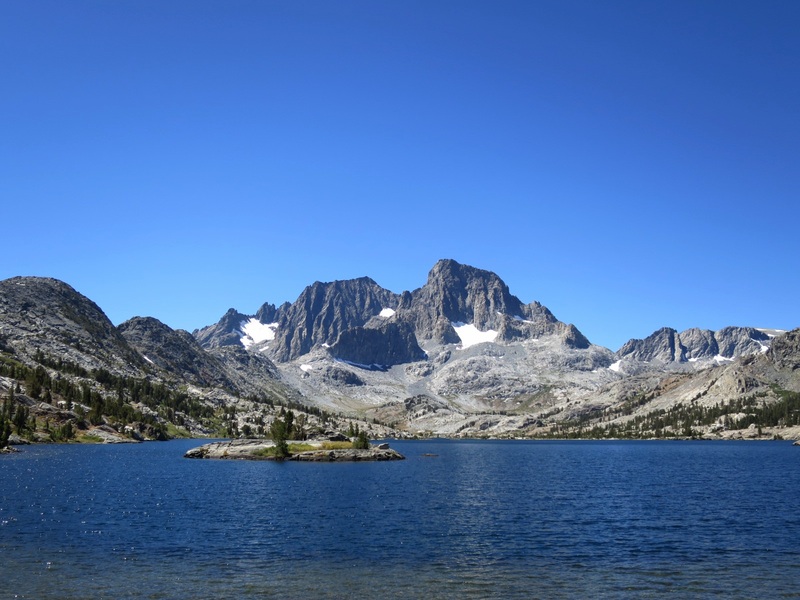 It is a large, clear lake with Mt Ritter and Mt Banner towering above. Laurie took Andy to a rocky outcropping with a wonderful view. 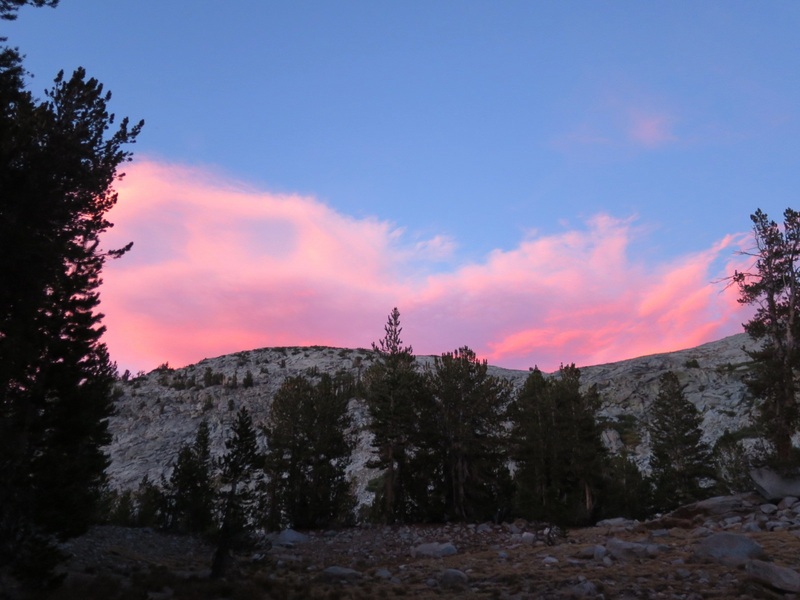 This was one of her favorite campsites during her JMT hike. Here we ate lunch and Laurie fell fast asleep. It was noon before we were moving again. 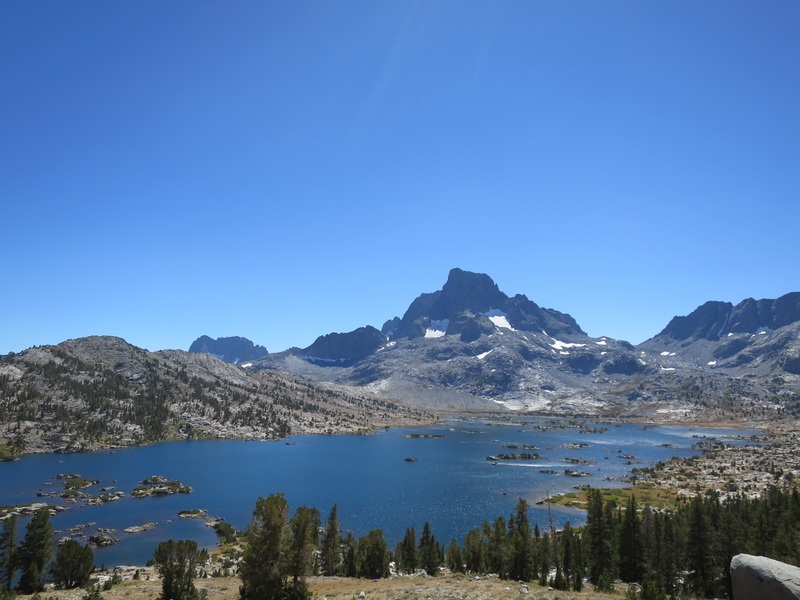 We walked around Garnet Lake and climbed again toward Thousand Island Lake. This lake was similarly spectacular. Little granite islands popped out of sparkley blue water. We stopped again, this time for Laurie to go swimming. After a quick dip we climbed up to Island Pass. We walked through large granite boulders mixed amongst yellow grasses and occasional puddles of water. Island Pass doesn’t feel like a true pass but it is a high point between Thousand Island Lake and Davis creek. The descent to Davis Creek felt long. 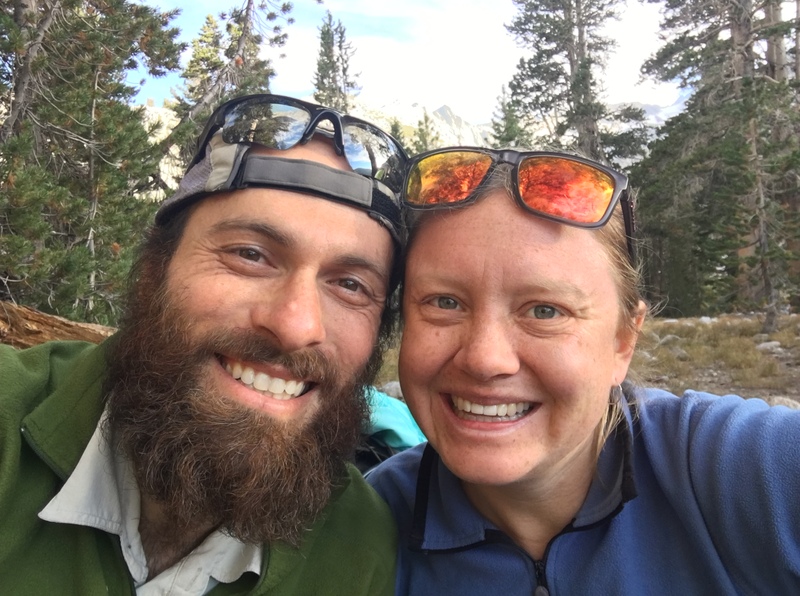 We were both hot and tired and knew that we still had to go up and over Donahue Pass. We got water from Davis Creek and Laurie sat for 2 minutes psyching herself up for the final push of the day. We both prefer climbing to descending and once we start moving we are fine, but that first step is sometimes very difficult. The climb up Donahue was gradual but long. 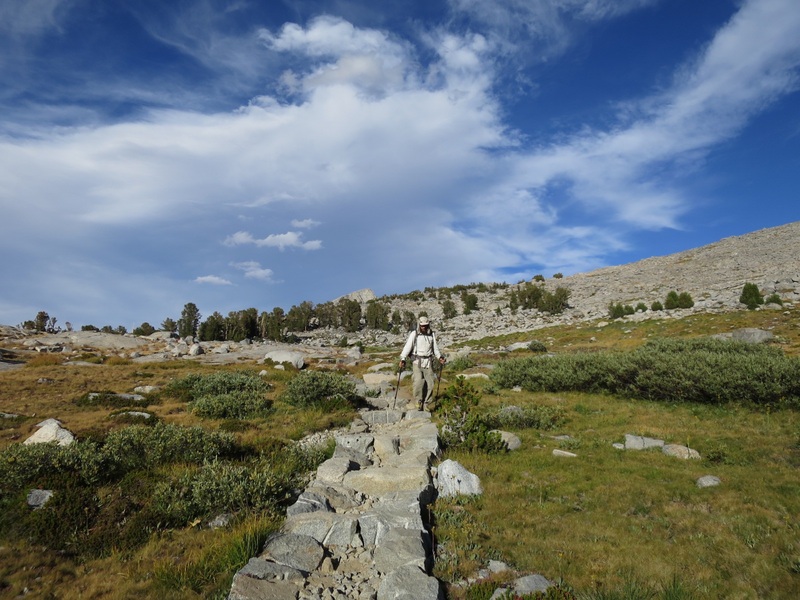 We made our way up large steps, crossed dry stream beds and wound our way through large granite boulder fields. It was nice to be back in the land of granite but our feet felt the difference. Both of our feet ached at the end of the day. Rocks are much less forgiving than dirt! We had planned for a cheese break at the top of the pass but changed our minds as the wind had picked up. We were tired, Laurie had a headache and was getting grumpy and we just wanted to get to camp. We dropped down to Lyell Fork and found a nice spot in the trees. We ate our remaining cheese while enjoying the last bit of sunshine. 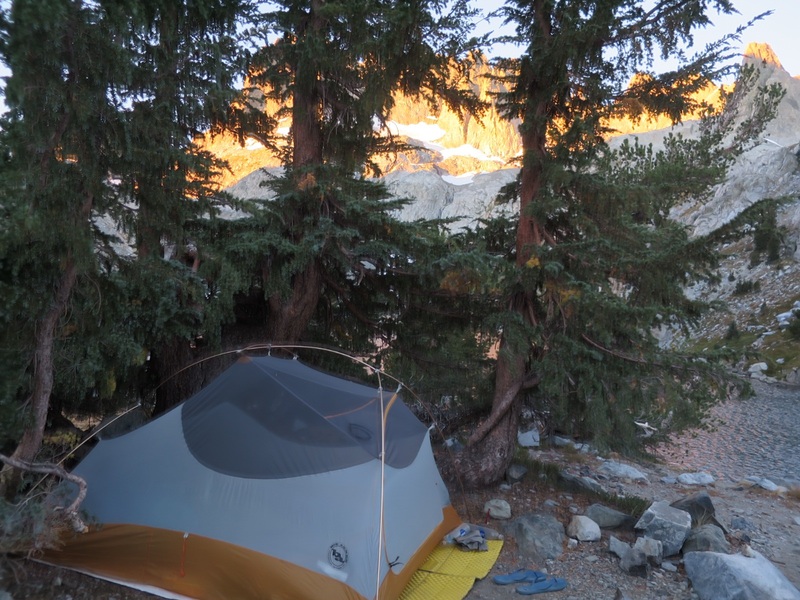 As soon as the sun dipped behind the mountains the temperature dropped and we quickly erected the tent and Laurie climbed inside. We ate dinner and were asleep by 9. Tonight we are grateful for afternoon naps and plentiful sunshine. 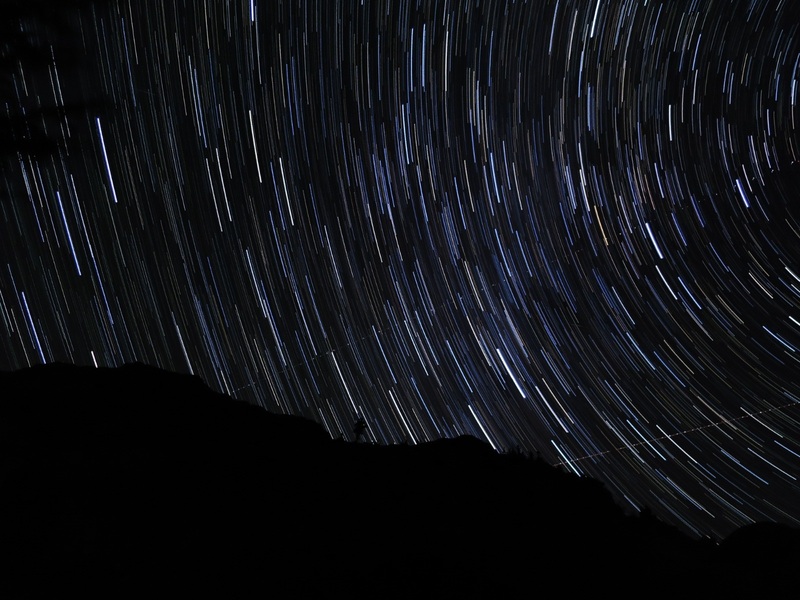 Love your star trail photo, good work. Enjoying your blog and keeping track of you two. Laurie totally you should only read instructions and watch vids when all else fails. Love the star shots! We looked at the pics of Donohue Pass and realized the reason we didn’t remember it was that it was all under snow when we were there three months ago. So nice to see. It really is amazing how different the landscape is at the end of summer. 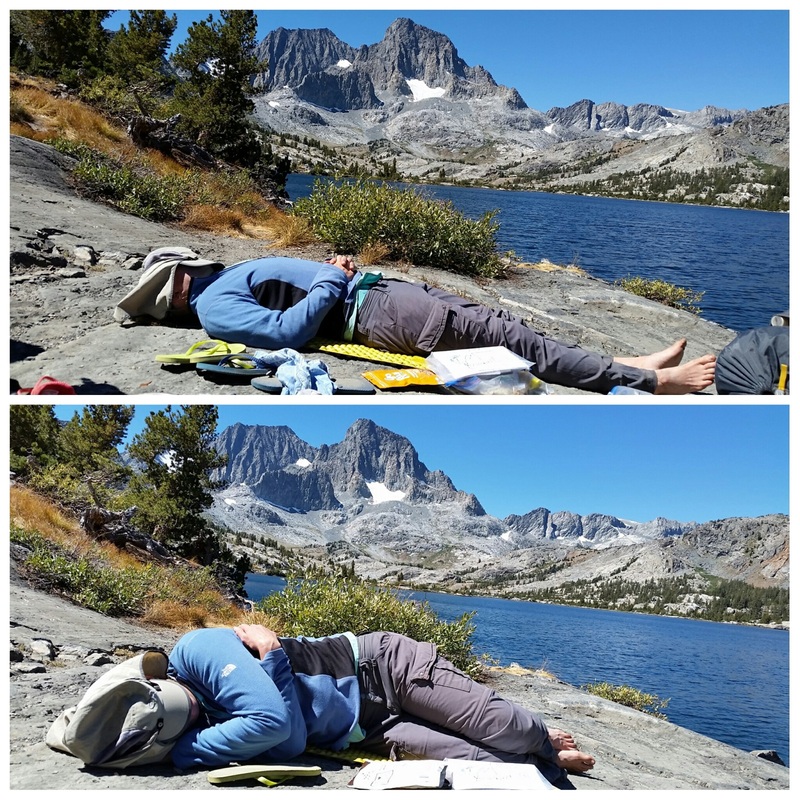 We hope to find journals of hikers that went through in June and compare!